We have been recognising and naming 2D and 3D shapes. The children went on a 3D shape hunt around the school grounds. "I've made a car park using cuboids"
On Red Nose Day the children dressed in Mufti clothes and brought in £1 for a Red nose. We talked about why money was being raised, designed noses and danced to the Red Nose day song! 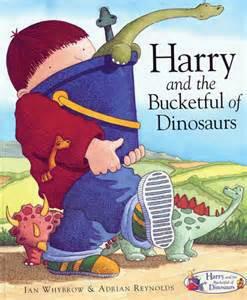 Our core book for the first part of the Spring term is “Harry and the Bucketful of Dinosaurs”. The children enjoyed doing a variety of activities around this book but particularly enjoyed painting dinosaurs and learning dinosaur names!